Young Chefs Academy franchise business opportunity. 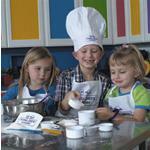 Free Young Chefs Academy business franchise information. At Young Chefs Academy, Julie and Suzy teach culinary skills that build upon each other to progress into more complicated food preparation. While learning such skills is the main ingredient at YCA, Julie and Suzy add a heap of kitchen safety, a scoop of etiquette, a handful of napkin folding and table setting, a pinch of menu planning, and laughter to taste. Their kid-friendly kitchen classroom also provides a "real" setting so that the students can use what they learn in their own homes. Young Chefs Academy, LLC is currently looking for qualified candidates to own franchises in all areas of North America. To learn more about Young Chefs Academy franchise opportunity, simply complete the form below.